I’ve started my drawing class. Drawing is proving much more emotional than I expected. I’m swamped with anxiety whenever I pick up my pen or even think about picking it up. I keep drawing shaky lines because my hand is quivering. I don’t know where this fear is coming from. I hope I can work through it, get past it, and reach a point where drawing is fun again. I remember loving to draw when I was little, but I’ve lost the ability to enjoy myself as I’m drawing. 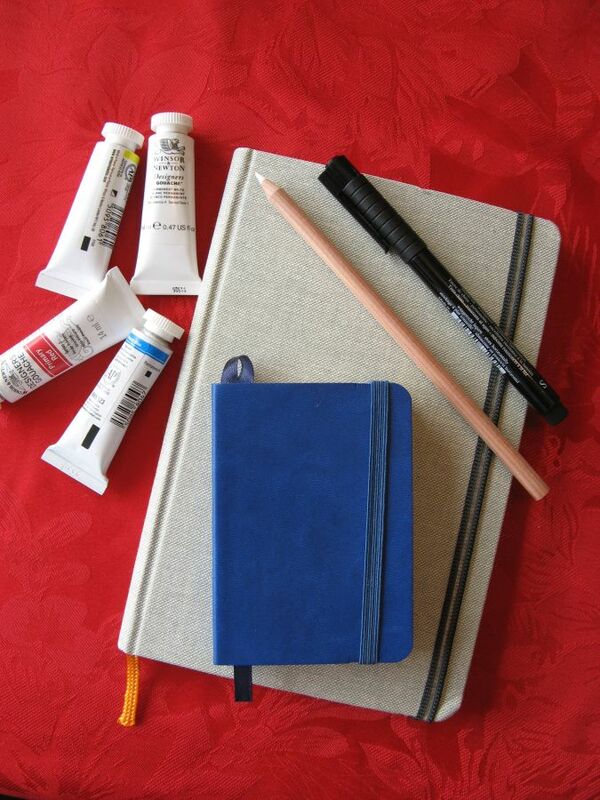 My new art supplies, waiting for me to pick them up. In discussions with my online drawing class, I talked with another student about my frustration at not being able to draw “what I see”. That what I draw doesn’t look as I intended it to look is a more accurate statement. I said I hoped with more practice, I would master this skill. The teacher made a comment that cut to the heart of things: maybe I will master drawing, maybe I won’t. I should just explore the world of drawing. Experiment and see what happens. Find out what kind of artist I am, instead of setting standards for my work based on the art I’ve been exposed to all my life. I hated reading that, because he is absolutely right. I need to let go. My expectations are just getting in my way. They are part of the reason my heart is racing when I draw. Though I can’t hear it, my nagging Inner Critic is whispering in my ear that I am wasting my time. My drawing will never be as good as it “should” be. Letting go of how it should look will free me up to enjoy how it does look. But the thought of letting go of my expectations also makes me sad. 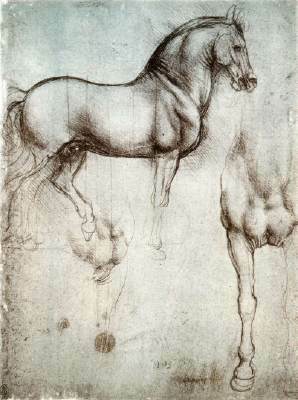 I want a sketchbook full of pencil studies that look like a page by Da Vinci. But I am not Da Vinci. There is a human element to making things by hand. Our personalities intervene. Our way of seeing the world plays into the work, as does our physical being. My nerves influence my drawing as my mind does. If my hand is shaking, I’m going to get some wobbly lines. I’m not in control of everything that goes into the drawing. While all of it comes from me, some of it is beyond me. I can choose what I think. I can think that I am just drawing to see what happens. I am looking at something and translating it to the page. The goal is to find my visual language, the lines I make to describe what I see, not to copy someone else’s style, or even to meet someone else’s standards. Writers talk about finding their voice. Voice comes by writing, writing, writing. My visual voice is going to come from drawing, drawing, drawing. I just need to keep picking up that pen. Have you had to change your vision for your creative work in order to do it? How do you get out of your own way in order to create? Will do. You might also be interested in a group that promotes art to help those with addictions: http://www.addictionandart.org/ . They promote art as a healthy outlet for those suffering from addictions, as a way to process and heal. This is such a good point. It’s so hard to let go. But if we love something, there can be so much joy to be found in doing it, even imperfectly. I so believe that (we get joy from doing what we love no matter how well we do it) and I’m happy to report that I found a very helpful quote yesterday: Accumulate pages, not judgments. So I am now just drawing — good, bad, and ugly — and not worrying about how it’s turning out. And I’m feeling a lot less fearful. I hope it lasts! I agree. I find I become very unhappy if I don’t draw, so more than anything else, like whether I’m any good at it or not, I’ve learned that it’s just something I have to do. I tell myself the rest will have to figure itself out. That’s part of how I got started writing: I felt better and was just happier if I wrote than if I didn’t. I’m realizing many of the same lessons I’ve learned about writing apply to drawing. The one I’m using now is: Quantity not quality. Don’t worry about the product, just make stuff. Later I can decide if it’s got any additional value. The way I got over my fear and intimidation – I started using a Sharpie to draw. Pencil can be erased, and I only seemed to move forward, keep going, when my marks were permanent. Good luck with your drawing! I can’t wait to hear more about this online class – it sounds great. For the class I am taking, we have been told to use pens only. So I’m trying this. It is scary and freeing. I hope it will lead to good things. You’re right, of course. Making money from our various interests is appealing, but not required. Most of my creative output is for my own enjoyment. If others enjoy it as well, great. If not, it should be no skin off my nose. But I sometimes make myself crazy by setting insane standards. I’m doing better since I have deciding it’s all practice.